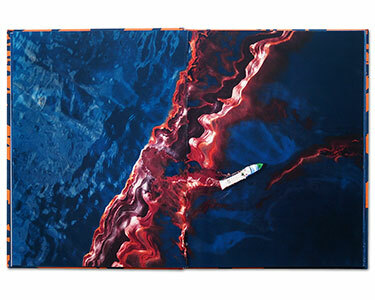 Spill features aerial photographs of the Deepwater Horizon Gulf Oil Spill. 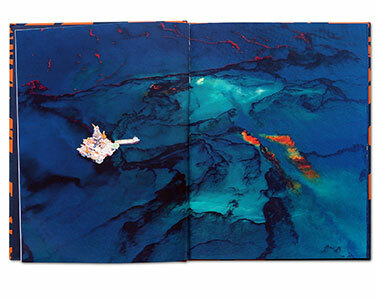 Collectively, these images present a damaged sea with the abstract appearance of veined marble in deep blue, green, pink and rust. The human presence takes the form of tiny toy-like helicopters and ships, and an oil platform that, on first glance, seems to be a fantastical Chinese sea palace. Only the billowing smoke from a great fire signals the true destruction caused by the disaster. Captured from above the disaster takes on a monumental scale far removed from the human and natural drama on the ground. 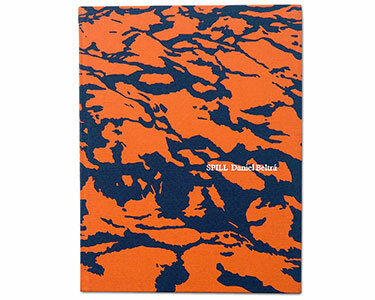 BP’s Deepwater Horizon oil platform exploded and sank in the Gulf of Mexico on 20 April 2010. Over 210 million gallons of crude oil were released into the ocean and this oil covered 68,000 square miles. One of the most destructive environmental disasters in human history the full consequences of this incident remain unknown. 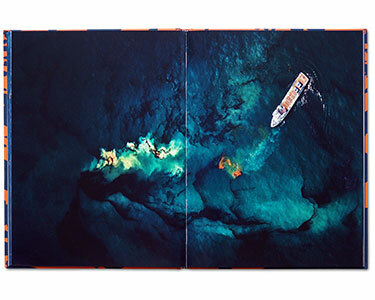 Beltrá spent over 40 hours taking aerial shots flying at 3000 feet above the sea to document the disaster. Daniel Beltrá was born in Madrid, Spain, in 1964 and is currently based in Seattle, US. He began his photographic career with the Spanish National Agency, EFE before working with the French agency Gamma, and in 1990 he began his collaboration with Greenpeace. His work has taken him to all seven continents. 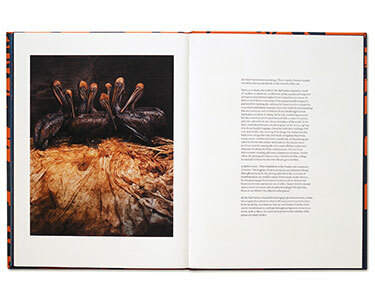 He was awarded Wildlife Photographer of the Year Award 2011, the Lucie Award for International Photographer of the Year and a finalist for Critical Mass for Photolucida for his work documenting the Gulf Oil Spill. His work has been published in The New Yorker, Time, Newsweek, The New York Times, Le Monde, and El Pais, amongst others. Daniel Beltrá is a fellow of the International League of Conservation Photographers and was nominated for the Prix Pictet 2012.